These are the approx ranges of products it depends upon the size, specifactions and depend upon the order of quantity. Triart Creations Export Pvt. Ltd. LED billboards are used for outdoor advertisement . These boards are mailnly used in Posh areas to Higlight business . 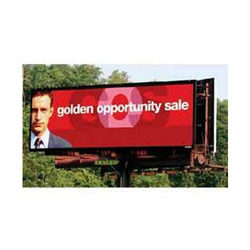 A cutting-edge electronic advertising solution; LED Billboard is provided by our company. This LED Billboard is available in the market at most reasonable prices. Our team produces this LED Billboard using advance technology and good quality material that we sourced from the reputed vendors of the market. Billboard advertising grabs the attention of potential customers like no other form of advertising can. Brand awareness and strong name recognition. Commercial, low maintenance Bill Board Lights is an answer for cost effective and Visually stunning outdoor billboard lighting solutions. Simple installation and an excellent warranty make Choosing our Bellatrix Bill Board Lighting Solution an easy decision. KEY FEATURES Digital LCD Billboard replaces existing paper billboards at premium location. These have a wide range of applications which are classified in different sections of display such as text, graphic, animation, counter, time, temperature and humidity independently with rich effects and sophisticated schedule. They are mainly used in spectaculars and road side display.